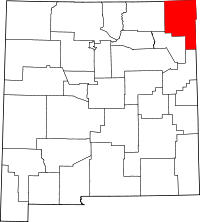 With about 4,200 residents, Union County is the 4th least populated county in New Mexico as of the 2000 census, and most of them reside in the county seat of Clayton. The county is located in the northeast corner of the state, bordering Colorado, Oklahoma, and Texas. Several departments and agencies either have actual records on file, or provide a number of resources and directions for further research. The Union County NMGenWeb Project offers a variety of links and local histories on its website, all provided free of charge. The New Mexico Genealogical Society also lists a number of resources for research, including a detailed listing of local churches and the records each has on file. The County Clerk at 200 Court in the county seat of Clayton, NM, has a large number of actual records on file, and all are included in the public record.